So $40 gets you in to the Pecos Conference, 3 days of southwestern archaeology nerd-gasms. But wait!…..There’s more! Also included was the option to attend a field trip on the Sunday of the conference. No additional charge….If you call now! There were five tours offered (later expanded to seven due to demand), each one different. 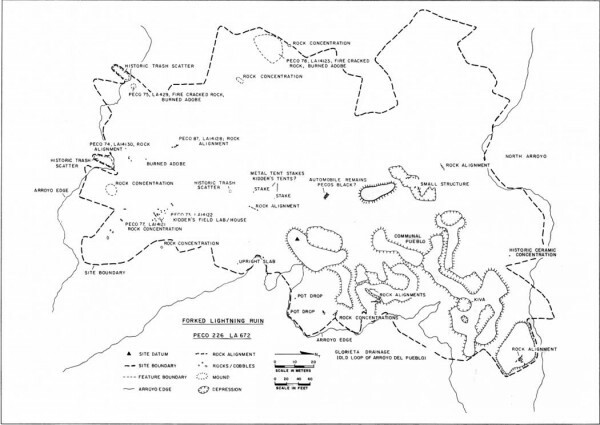 I studied them for a while and decided on one called “Pecos Before Pecos: Early Pueblos and Early Archaeology of the Upper Pecos Valley”. I wasn’t sure exactly what it was about, but I knew it was near the Pecos Conference so I wouldn’t have to worry about locating it. A good reason as any for selecting it, I suppose. It was scheduled to run from 9 AM until 2 PM and involved hiking, so that upped its interest level for me. 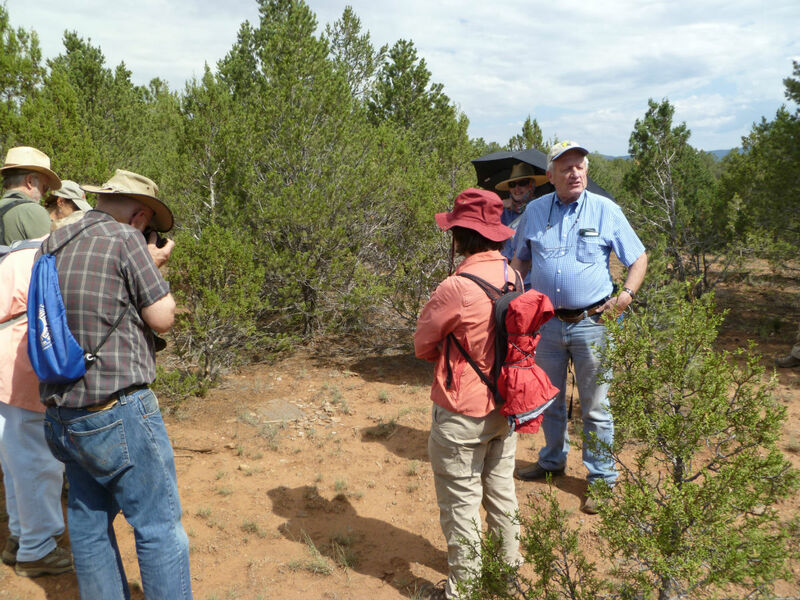 About 15 of us met near the Pecos National Historic Park visitor center. The group was a mixture of archaeologists, “enthusiasts” (such as myself), and a few suffering spouses (such as Jeri). 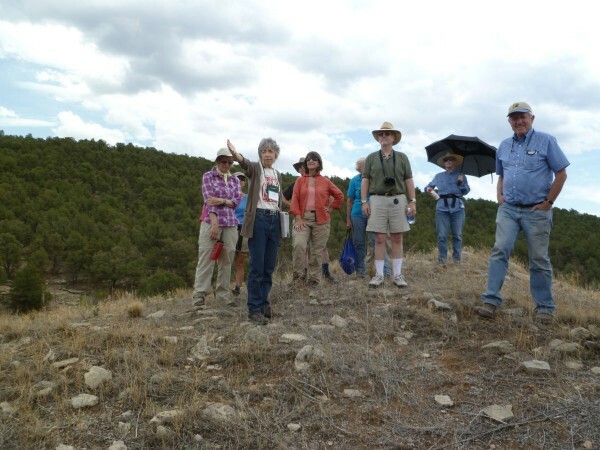 Our leaders were Linda Cordell, who was the University of New Mexico director of excavations for one of the ruins we’d be going to, and Gen Head, who was field director for the NPS Pecos Archaeological Survey. We left the visitor center and started our hike to the first site, the Forked Lightning Pueblo. For some reason having to do with Texans, it is pronounced “”four-KED”. 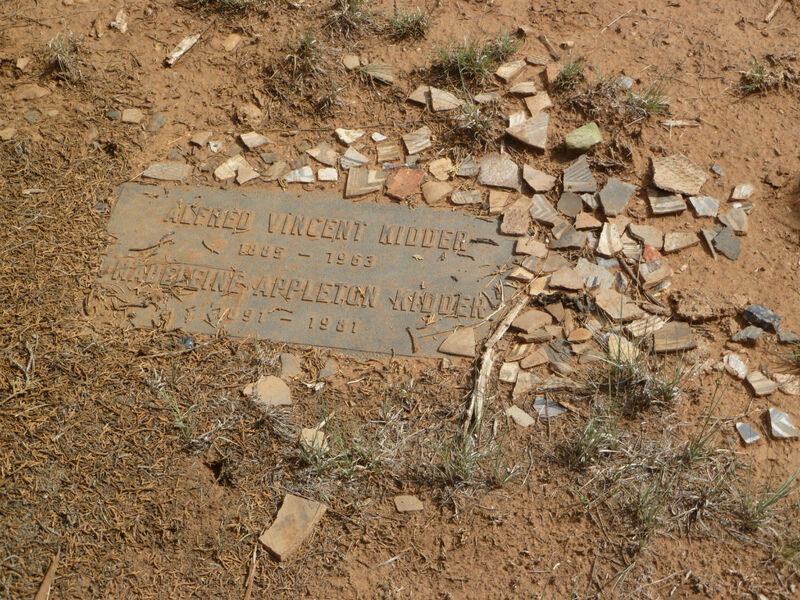 The site was excavated between 1915-1929 by Alfred Kidder, a very noted archaeologist of the era. 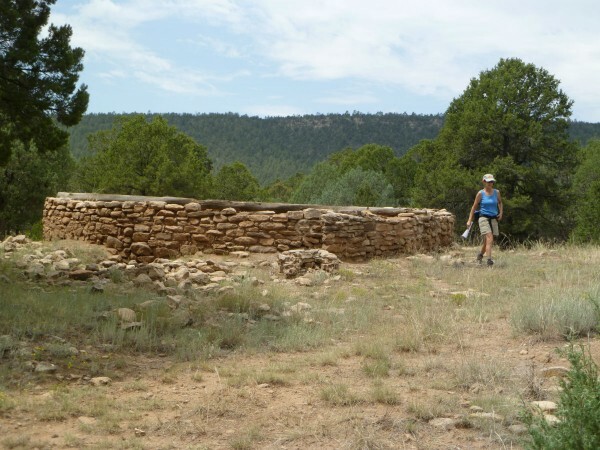 It’s a slightly unusual site as the structures weren’t constructed of rock, but rather adobe. This meant most of the site had melted away over the years. 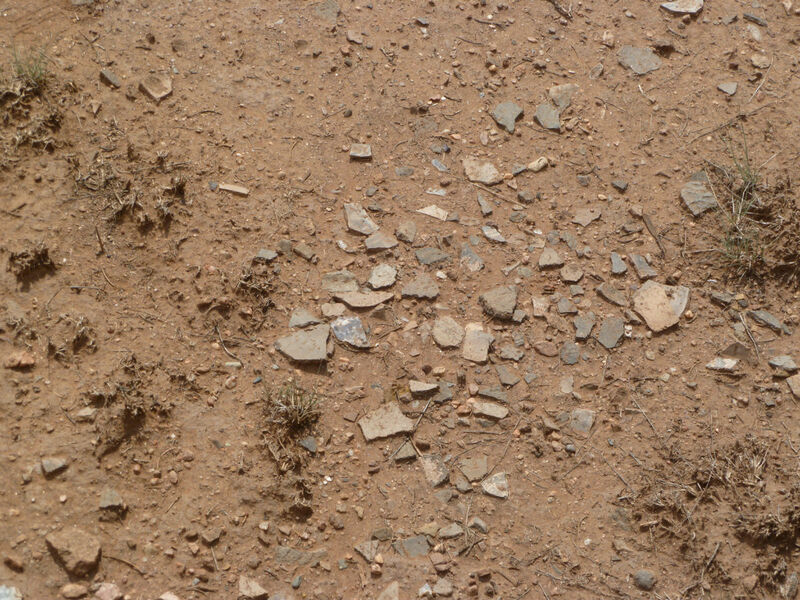 When excavated however, stub walls below the present ground were found. The site is sprawling, and thought to have somewhere between 140 and 150 rooms. Because of the meltiness of the adobe, Kidder was never sure. 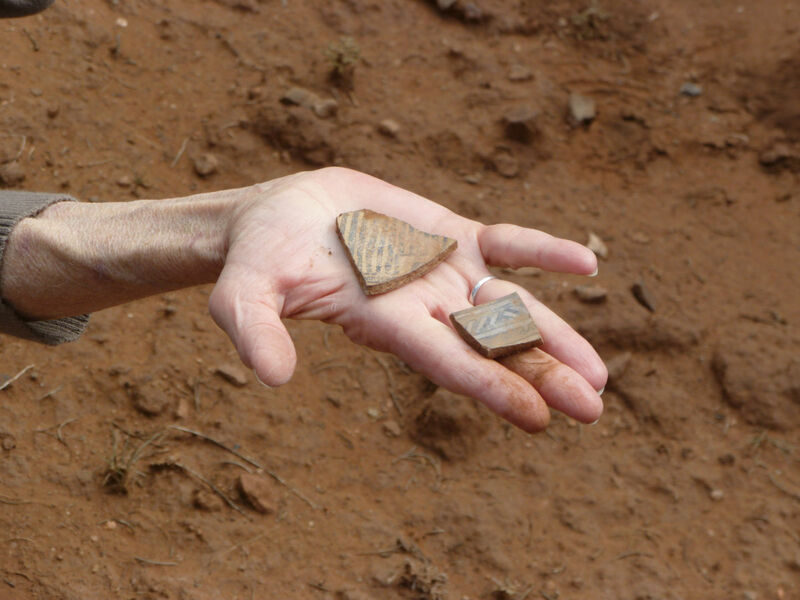 The site is believed to have been occupied between 1200 AD to 1450 AD, based upon ceramic dating. Speaking of which, there were craploads of interesting shreds littering the site (“craploads” is a technical measurement term I learned at the conference). 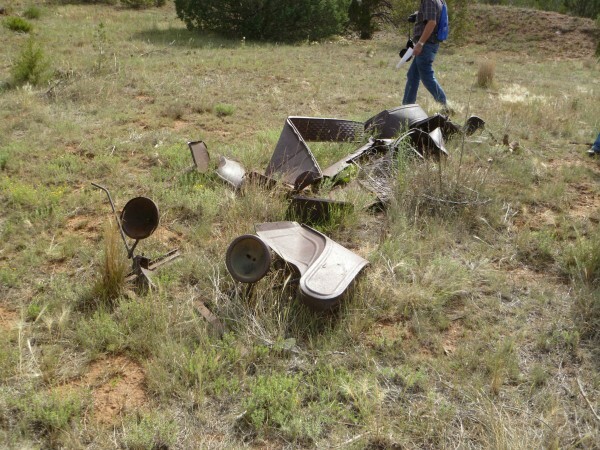 One of the non-pueblo items on the site was the presence of one of Kidder’s old field vehicles, known as “Pecos Black”. Oh yeah, Kidder was still there too. The ashes of Alfred Kidder and his wife Madeline are buried near the site, beneath a brass plaque. It’s the sort of thing that unless you know where it is, you’d never find it. Fortunately we had along Rudy Busé, Kidders grandson. Rudy is a long time volunteer at Pecos, carrying on the family tradition, and not only lead us to the grave site, he shared a lot of interesting Kidder family stories. Hiking back to the visitor center, we got in our vehicles and headed off to our second stop, the Arrowhead Pueblo. Its location is a good example of the NPS’s sneakiness. 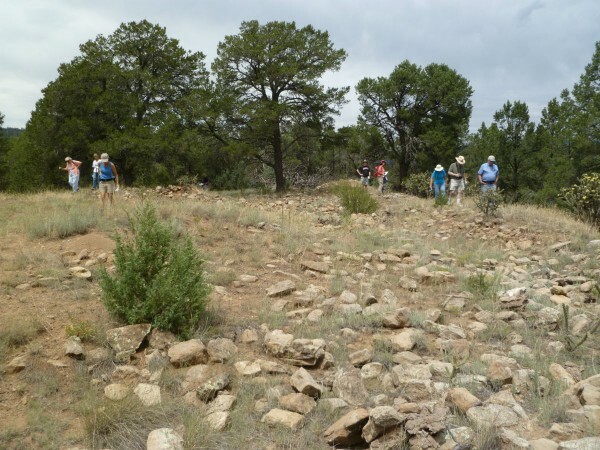 The Pecos park is a big place, with many sites from not only the early pueblo era, but also the Santa Fe trail period, as well as civil war battlegrounds (it sort of has it all). It turned out the Arrowhead Pueblo ruins were smack dab in the middle of a completely different site, hidden in plain sight. Unless you knew where Arrowhead was, and went off the “normal” interpretive trail, you wouldn’t find it (see a pattern here?). But we had along Genevieve Head, who mapped the site for the NPS, so she certainly knew where it was. Arrowhead Pueblo is located on a ridgeline and has about 105 rooms. From ceramics, it is believed to have been occupied between 1200-1450 AD. 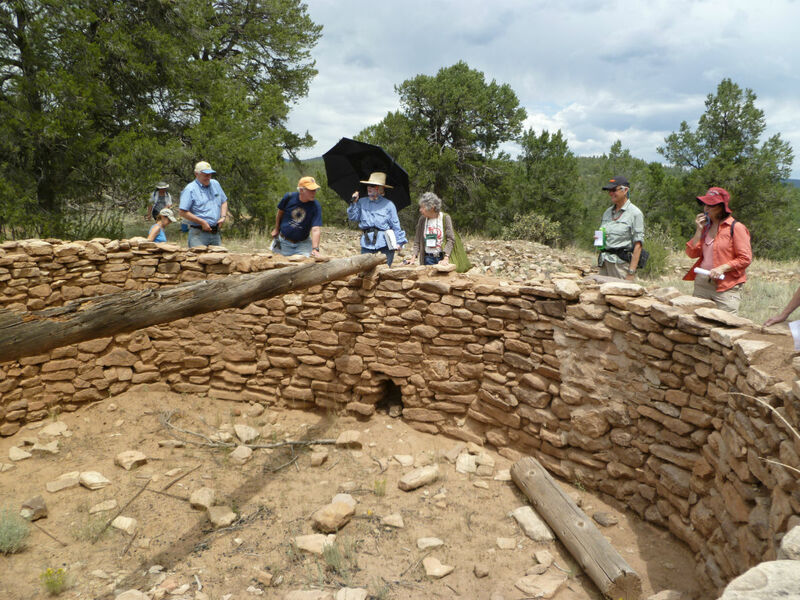 Its siting is such that it appears possible to see the main Pecos pueblo from this ruin. 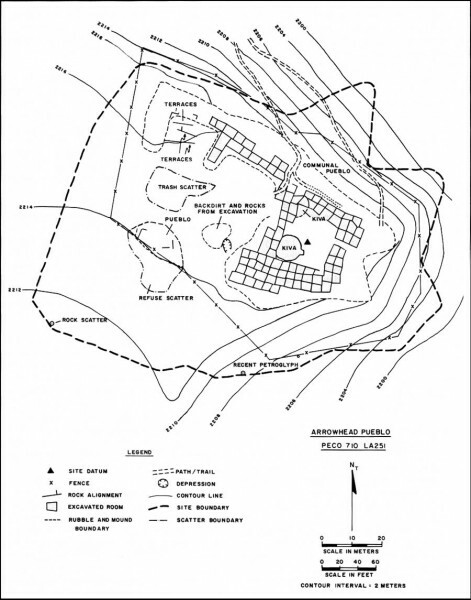 It had a different feel than the other sites, as it appeared to be located and constructed in a defensive manner. 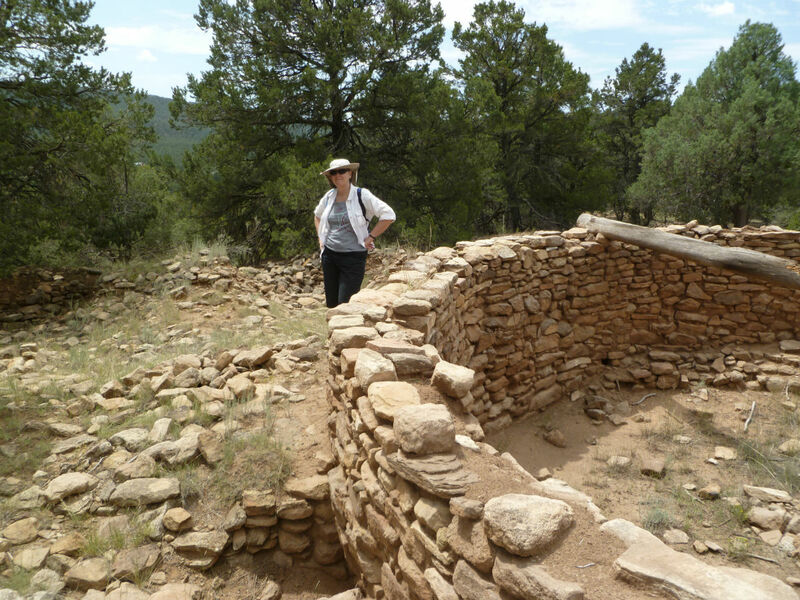 The roomblock design and remains stuck me as very similar to the many Jemez ruins Jeri and I had been exploring. Our last stop was near the town/village/flyspeck of Rowe. 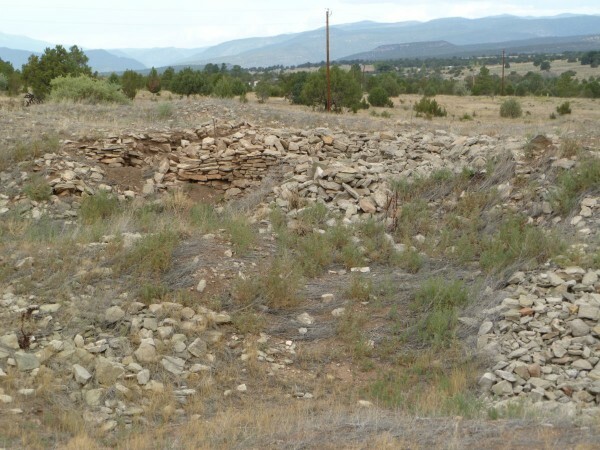 There, on private property, were the remains of a large three plaza pueblo, the Rowe Ruin. It was most recently excavated by Linda Cordell, who led us along the top of the collapsed roomblocks. A good portion of the pueblo was two stories, so the mounds were high. It was an oddly symmetric and rectangular layout, not the usual sprawl seen elsewhere. While I can’t say it was an especially fascinating site, it was a treat to have the most recent excavator along to point out things we would have been otherwise clueless about.